Langtang Region is the third most popular mountainous region in Nepal. It is popular not only as an ancient trade route between Nepal and Tibet but also as nearest and most accessible to and from Kathmandu Valley. 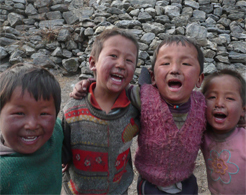 Langtang lies just about 130 km north of the Kathmandu Valley equally closer to the Tibetan border. This region is a rare combination of nature, culture and adventure at once. Langang had been declared national park in 1973 becoming first national park in the country. Langtang region is home to Nepal’s first national park, Ganesh Himal and Langtang Himal. This region comprises Langtang Lirung (7,245 m) the 99th highest mountain in the world, Ganja La pass (5,122 m), Jugal Himal and Dorje Lakpa (6,989 m) a vast Himalayan panorama around. The trekkers in the region encounter with rushing waters of the Langtang River, the valley with rhododendron, bamboo, birch, juniper and pine and host the red panda among other rare Himalayan wildlife. 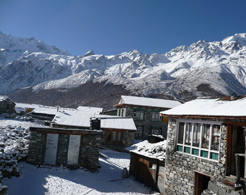 In Langtang region tourist can experience trekking in exhilarating scenery of soaring peaks, glaciers, ancient monastery and even a rare cheese factory in this mountainous location.The park contains the Gosainkunda lakes, sacred to Hindus, which is considered as one of the most popular trekking area of Langtang region. Goshaikunda sometimes also spelled as Gosainkunda and Gosain Kunda is very famous trekking route as a religious and adventurous highland. Goshainkunda Lake that lies between the Langtang valley and Helambu regions is amazingly beautiful trekking destination. 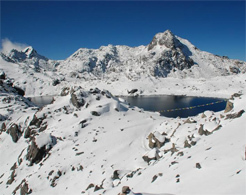 Goshaikunda (4,381m/ 14,374 ft), the mountain-lake is considered sacred lake in Hinduism as it is mentioned as created by Lord Shiva himself, in many Hindu religious scriptures. Religious tourists from Nepal, India and other countries reach here during the full moon festival of August and September every year. The trekkers can have view of illuminating mountains. 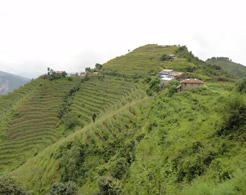 Helambu region that is usually included in Langtang Valley Trek (3rd popular trekking region in Nepal) is one of the unspoiled hilly region listed among shortest trekking routes from Kathmandu Valley. With rich cultural heritage and diversity; Helambu is a region of highland villages in Nepal that is just 70 kilometers away from Kathmandu valley. Because of easy accessibility from Kathmandu the Helambu Region is a popular among trekkers for mountain views from slight distance. As less visited trekking route; mountains in the region remain still a mystery for many. Helambu with its monastery culture resembles the Tibetan region as it is considered one of the Buddhist pilgrimage. The langtang valley trek is one of the most popular trekking routes in Nepal. After Annapurna and Everest region most of the tourists love to be at this site. It is easily accessible to Kathmandu that links Nepal’s Northern border with Tibet, China. This trekking route offers all the mountainous adventure and culture as it is home of some of the highest mountains in the world comprising legendry Sherpa dwellings down the line.Langtang lies just about 130 km north of the Kathmandu Valley. In Langtang region tourist can experience trekking in exhilarating scenery of soaring peaks, glaciers and ancient monasteries. Tamang Heritage trekking is one of the famous trekking in Langtang region .A reminder and legacy of Nepal Tibet war that took place almost one hundred and fifty years ago; ‘Tamang Heritage Trail’ is relatively a new trekking route in Nepal though a beautiful combination of culture. Starting from Dhunche or Syapbrubesi of Rasuwa the trekking route goes through Gatlang, Chilime, Thuman, Timure and Biriddim following the spectacular Langtang Valley. In this trekking route that offers panoramic view of Langtang, Kerung, Ganesh Himal and Sanjen Himal from Nagthali; trekkers can experience a mixed culture of Tibet and Nepal both.